Last Saturday I decided that I had had ENOUGH! I was fresh off the bus from the March for Life in Washington the day before and was feeling excited about doing something positive for life when out of my television I heard the familiar sound of the wii. It was grandson number two having a battle with a cartoon figure. January 25 was bitter cold – 14 degrees when we left the parish parking lot, yet it was a good day. My husband pulled a surprise move and decided to go along. It was really nice to have him there for support, and I truly appreciated it. On the way to D.C. the Pastor ran a movie about Blessed Pope John XXIII starring Ed Asner as the aged pope. I remember seeing television images of the little old man in his white coat and mitre because he was the pontiff of my childhood, yet I never really knew much about him other than a couple quotes that shed light on his beautiful humble spirit. I do remember the reforms of Vatican II and the tremendous upheaval the “poor country priest” began in the Church. It was because of that small tap of the first Domino on the Church’s table that I am who I am today. The effect on the Liturgy of the Church had a direct influence on me, because it was during that tumultuous time – a time when my parents watched friends walk away from the Church, never to return – that I was trained to become an organist for Mass. It was Sister’s idea. She was giving me piano lessons and for some reason convinced my mother that I should learn to play the organ. I didn’t realize that she had an ulterior motive. The order of sisters who had served our parish from it’s beginning, taught in the school, played for the liturgies and directed the chants of the choir at High Masses decided to pull out of the parish. They were going through some upheaval of their own. Some of the sisters left the convent completely, some decided it was better to go into the cities and work among the poor than teach 8th graders their Catechism or play for Funerals. So it was out of dire need, in the summer between my 8th grade year and High School, that I was given the task of playing for Mass and it sealed my fate forever. I became the official organist at the age of 14, playing for all the Masses. By this time the Mass looked and sounded completely different. The Church was renovated to turn the altar around, the altar rail was tossed into the dumpster and the organ was moved from the back of the Church to the front. The music, too, was totally unlike any of the chants I grew up listening to. It had a distinct “hootenanny” feel to it, especially when they let (gasp!) guitars into church. It felt and sounded more like the Pete Seeger and Peter, Paul and Mary records my older sister played incessantly on her 45 record player than the stuff in the Gregory Hymnal. I wasn’t very good yet but the parishioners, who were trying to put on a happy face about the whole thing, remained very patient with me as I learned. I played for parish Masses on weekends and school Masses in High School, getting a special dispensation to leave school for the parish when there was a funeral. What I wasn’t aware of at the time was John XXIII’s dedication to nonviolence and peacemaking. I never read his beautiful encyclical Pacem in Terris that was written just three months before his death. He believed in ecumenism, reconciliation and unity. He promoted understanding and dialogue rather than the mistrust and espionage of the Cold War. After the Newtown, CT shooting there was a few days of what I thought was respectful silence while the town buried their children. What I didn’t know was that it was more like the prelude to a tsunami when the shoreline is drawn back into the ocean because a tremendous wave was building up. As soon as the last hymn of the last funeral was finished the shouting and accusations began flying and it’s now becoming more and more shrill and hateful. Voices were coming from all sides, blending into a kind of mass hysteria of suspicion and fear of anyone whose opinion differs – on any topic, not just guns. Anything is fair game, even another person’s faith is held up to the light of public scrutiny and social bullying. If I read a news article about the Catholic Church there follows post after post of anti-Catholic venom ranging from making the churches pay taxes to making laws against any religious expression. If I read a blog from a priest, there are people – Catholics – who don’t think he’s Catholic enough (huh?) and they spew their opinions as if they’re Scripture verses. An insightful article from a professor or professional on any subject is fodder for people to attack them with accusations and curses because it was not the opinion of the writer. It’s madness. It’s like we’re putting ourselves into another Cold War against each other. In my home there will be no more “fighting games” on the wii or computer. I don’t care if someone likes fighting games and can quote me research that it doesn’t harm children – I don’t want them in my home! No more negativity. In my home there will only be words that will build others up, not tear them down. No more angry words about anything, even if the dog gets into my yarn and makes confetti out of my afghan. No more reading memes or forums online – these are a trap for me and I’m not going to let myself fall into it. Since I’m removing the negative I will need to replace it with something positive, so I’m going to dive deeper into my Catholicism by reading words of peace, reconciliation and understanding. 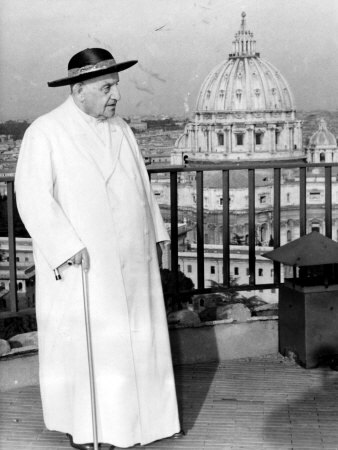 There are several modern saints and almost saints to choose from, but I figure Blessed Pope John XXIII is a good place to begin. This entry was posted in The Church Diva and tagged Catholic, John XXIII, life, saints, Vatican II, violence. Bookmark the permalink.